Back in May ’16 I had an amazing consultation with Caitlin and Patrick, based in Seattle they were getting married at Hedsor House. Having already delivered to the Georgian mansion, I already knew the day was going to be beautiful but the more we chatted about their vision for the day, the more excited I was! With so many amazing ideas, it was hard to settle on one. The first design was incorporated marble, gold sequins (based on invites) and wild deep coloured sugar flowers to compliment the flowers on the day. It was gorgeous but after some time the couple wanted to see if we could revisit it. With more things being finalised and more intricate details being added to their day, they didn’t want their cake to be overdone. I completely understood, it needed to be a design to compliment the day and having so many elements on a single cake might have felt messy. 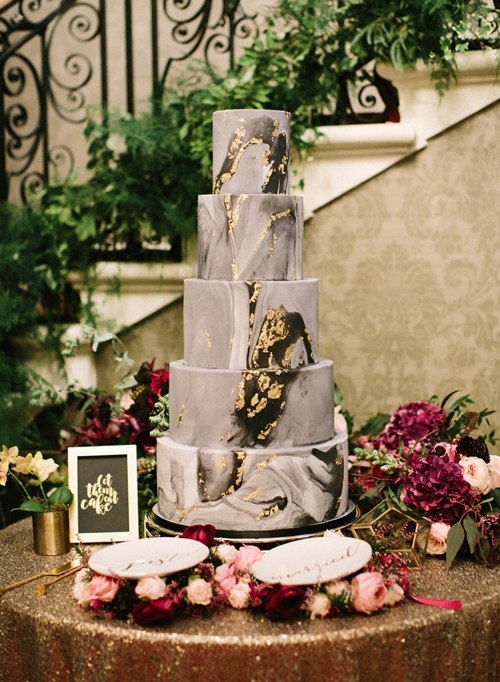 The final design was a deep marble cake with gold leaf running through that the couple loved. You need to check out their feature right here on Ruffled Blog! Fall in love with the breathtaking photos by Greg Finck and read about how much love and effort was put into their day.